How far will you travel for paradise? For that quest, some of us will inevitably and literally cross oceans. While I was in the Maldives 2 months ago, I received a lot of requests to do a comparison write up between Maldives and Tahiti, where I was less than 2 years ago. It’s taken me quite a while to do that because there are a ton of differences, and I wanted to expound carefully on each topic. The biggest and most obvious difference is their different locations. And more than just locating where each place is on the map, I also want to help you find your way there. As geography and the topic of getting there is quite extensive, this article is part of a main one that I am currently doing: a comparison between Tahiti and Maldives, in order to help you determine which paradise location is best for you. And because they are located in different oceans, where you are from is a big factor in determining how you get there. We are quite lucky in the sense that Australia is located in between the Maldives and Tahiti. So flight times from Australia to both places are almost the same. Where it differs greatly is in the number of carriers that fly to each places. Most of these are codeshared flights (such as Emirates , LAN, and Qantas). We took Air New Zealand from Sydney to Auckland, stayed overnight, and then flew from Auckland to Papeete the next day with Air Tahiti Nui. There are more flights than ever now from Sydney to Male. We took Malaysia Airlines from Sydney to Kuala Lumpur, and then took a connecting Malaysia Airlines flight from Kuala Lumpur to Male. The hub to get to the Maldives from Australia is Asia, and its a good idea to stop over a city in Asia on the way back or over for a two in one trip. The USA is geographically closer to Tahiti than it is to the Maldives. I’ve used Los Angeles as a point of reference here. 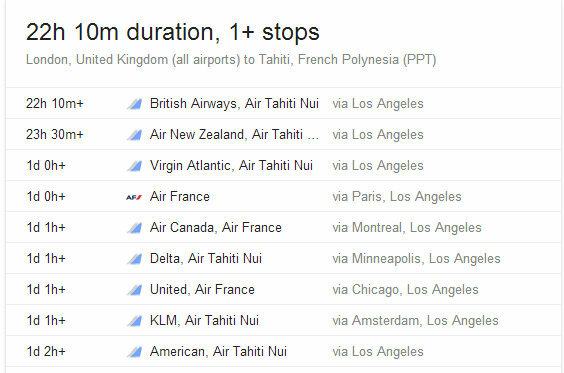 It’s so convenient to get to Tahiti from Los Angeles. We took the red-eye flight out of Los Angeles to Tahiti, departing at 11:10 PM and arriving in Tahiti 04:45 AM, with Air Tahiti Nui. The short flight time and proximity of Tahiti to the USA makes it a popular honeymoon destination for Americans. 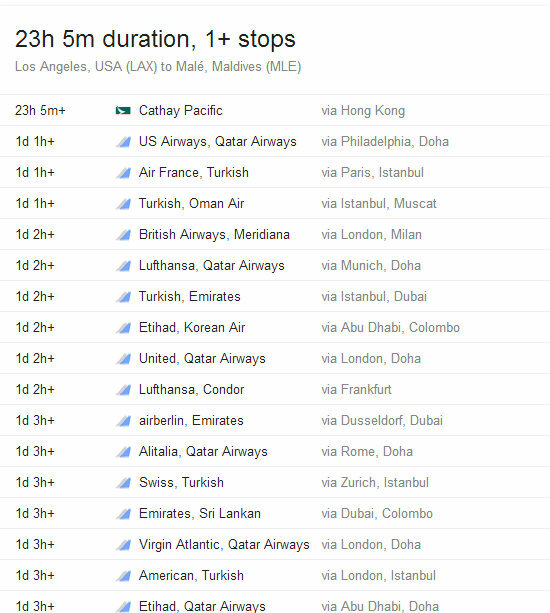 The list of routes and options are endless (only because there are a lot of flights that fly out of Los Angeles) , but if you look at the flight time, it is a pain in the A. However, the few who make it to the Maldives from the USA say that it is worth the trek! And some make it a 2nd destination to a two-part honeymoon, usually having the first stop in Europe or the Middle East. I’m using London as the point of reference here as it is the main hub. Europe seems like a world away from Tahiti, which can be ironic because Tahiti is part of France (hence the country’s actual name is French Polynesia. Tahiti is just one of the main islands where Papeete, the capital is). Just like their American counterparts, most Europeans use the stop over in Los Angeles to shop and have a different kind of trip before or after Tahiti. British Airways flies to Male direct from Gatwick, 3 times a week. But there are other airlines, mainly Middle Eastern carriers, that fly to Male from Europe. The flight times are not at all that bad due to the good connecting times in Middle Eastern hubs. 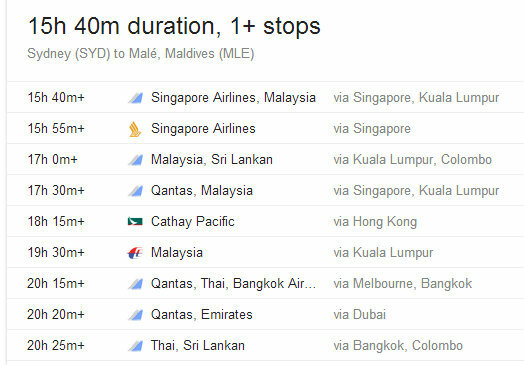 The flight times are even shorter than our Sydney to Male fight via Kuala Lumpur. I’ve used Singapore as a point of reference here. Between Hong Kong and Singapore, it’s safer to place Singapore as Asia’s hub to get out of the continent. Unless you are from Japan (where Air Tahiti Nui flies direct to Tokyo 2 times a week), it can be quite a trek to get to Tahiti if you are based in Asia. 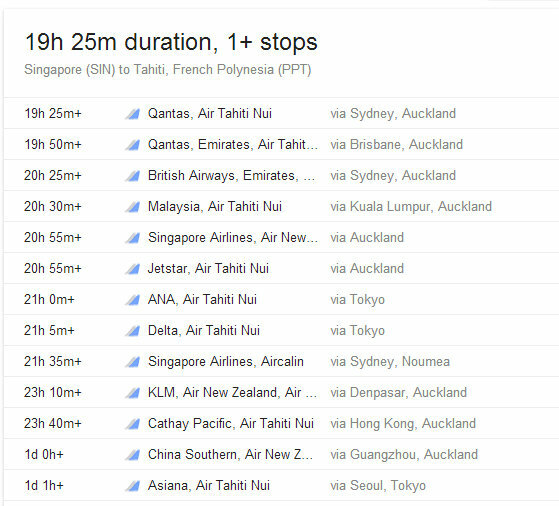 From Asia, you need to use either Sydney or Auckland as a hub to continue on to Tahiti. Most Asian passport holders will go via Auckland because most Asian countries do not require a visa to enter New Zealand. This makes it easier for them to transit or even stop over for a 2-part trip. Speaking of visas, as Tahiti is part of France, if you need a visa to enter France , then you will also require a visa to enter French Polynesia. Here’s important information for visas and passport requirements to enter Tahiti. 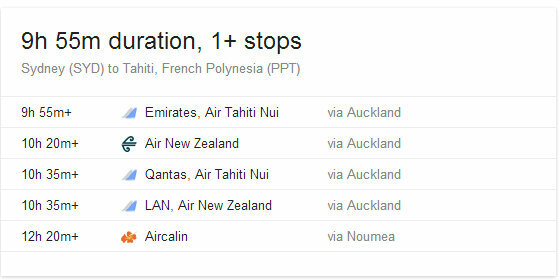 Yes it can be a bit of a hurdle to get to Tahiti if you are from Asia. Extra steps, but not impossible. 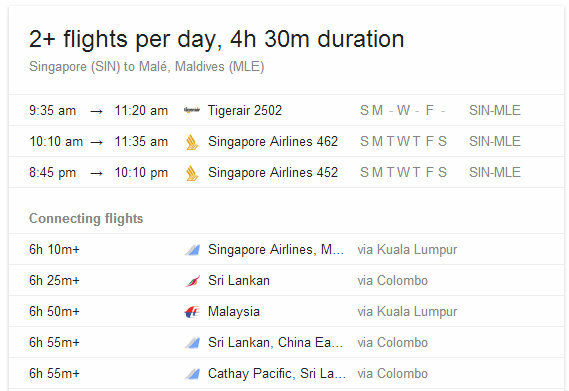 Almost all other Asian airlines fly to Male (Cathay Pacific flies to Male from Hong Kong, Korean Air flies to Male from Incheon South Korea, China Southern flies to Male via Guangzhou, Malaysia Airlines flies there via Kuala Lumpur, etc) Even budget carriers fly to the Maldives from Asia. 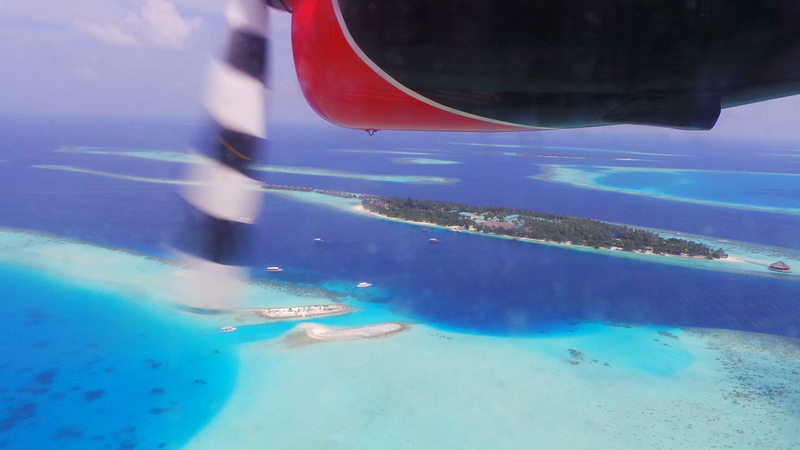 With just over 4 hours flight time, the Maldives really has become a very popular holiday destination for a lot of Asians, and not just honeymooners. *This is just the first part of a main comparative article on Maldives and Tahiti* stay tuned! Now that you’ve determined where to go, make sure you read on all my travel blogs about Maldives and Tahiti! Whichever location you choose, you are sure to arrive there in style! I know how I’m getting to Tahiti. you’ve done your research well, and you are also getting there in style! 98 days before we can make our resort bookings and then a little over a month after that we can book the airfare. 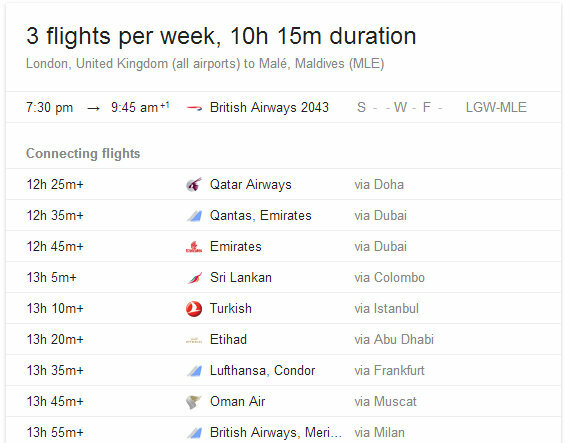 Dang, those are some long travel times from the US to the Maldives. I want to go there so badly. I should have stayed in Australia haha!